These fully loaded tortilla chips are piled with your favourite dip ingredients, all ready for someone to grab. Because everyone loves chips and dips, but when a party is in full flow and you are busy chatting, you just know if you dunk that chip into that dip….invariably you’ll spill it down your party dress or all over the floor. Enter individual chips and dips. One mouthful, loaded with flavor and ready to eat. 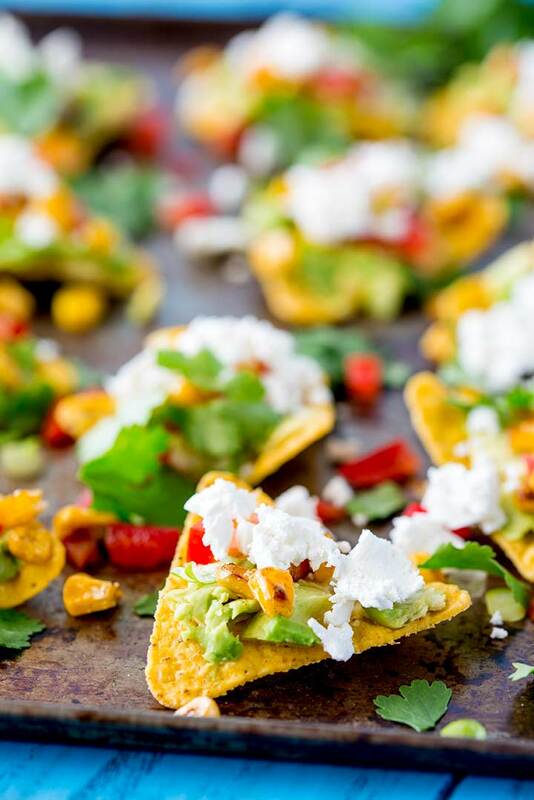 These tortilla chips are loaded with delicious creamy avocado, charred corn, chopped tomato, green onion and a sprinkles of queso fresco. Queso fresco, literally translates as ‘fresh cheese’, and you usually find it you find crumbled over enchiladas, tostadas and refried black beans. 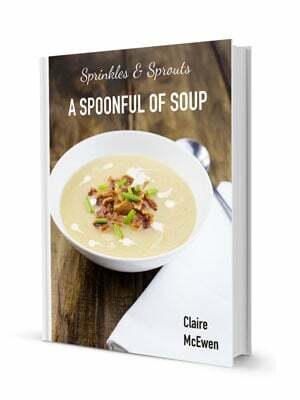 It has a mild flavour and a soft crumbly texture. It is easily found in supermarkets across the US. But here in Australia it is a little harder to find, but I did find some last week in the supermarket rather than having to head to the farmers market! But usually you have to look in specialist delis. What to use if you can’t find queso fresco? You can make it yourself following this method from Mary over at the Goodie Godmother. You can use the Indian cheese paneer. Just be sure to sprinkle it with a little salt as it isn’t quite as salty as queso fresco. Alternatively use a mild feta like a french or danish feta. 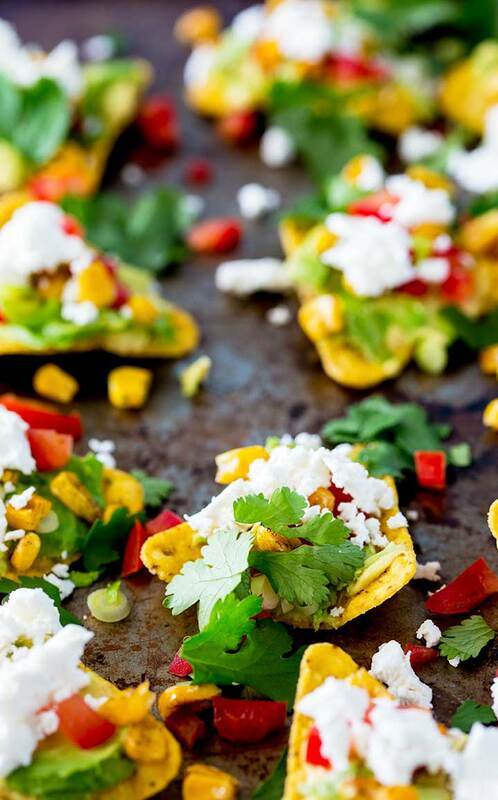 These fully loaded tortilla chips can be made a couple of hours in advance. After that, even with a spritz of lime the avocado starts to discolour. If you can find them, use shepard avocados, they will stay green for longer. 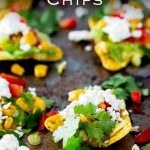 The tortilla chip will soften under the toppings, to ensure you still get that crunch from your chips and dip combo, make sure there is plenty of edges not covered with the avocado. Can I use frozen corn or does it need to be fresh? 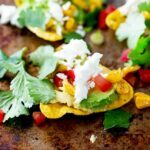 Obviously if you have a glut of fresh corn then use that…..and if you can find purple corn, it would love AMAZING on these fully loaded tortilla chips. These fully loaded tortilla chips are piled with your favourite ingredients, all ready for someone to grab. Because everyone loves chips and dips, but when a party is in full flow and you are busy chatting, you just know if you dunk that chip into that dip....invariably you'll spill it down your party dress or all over the floor. Enter individual chips and dips. One mouthful, loaded with flavor and ready to eat. Pour the oil into a heavy based fry pan and heat over a high heat. Add the corn and let it colour until lightly charred (about 2-3 minutes) then set aside to cool. Hope the flesh of the tomato into small dice and discard the seeds. Finely slice the white and pale green areas of the green onions. Spread the tortilla chips out on a serving tray. Cut the avocados in half and remove the flesh. 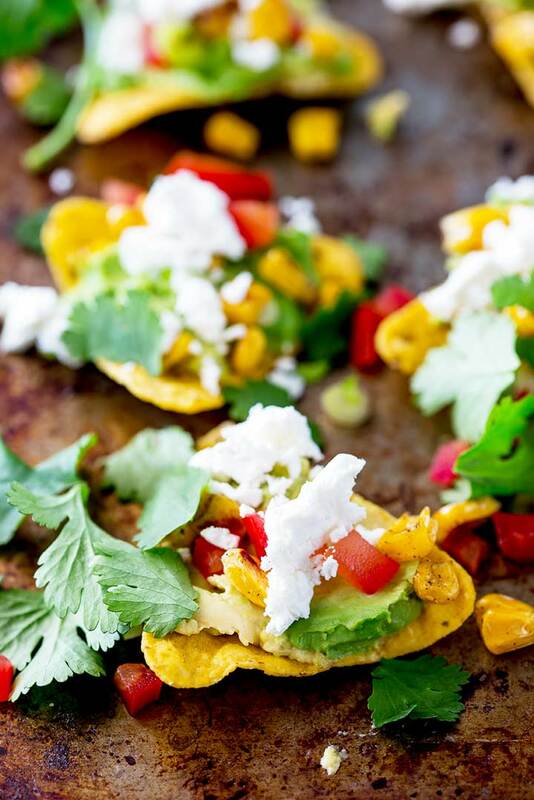 Lightly squash the avocado flash and give it a generous spritz with lime juice to help stop it browning. Add a spoonful of the avocado to each chip. Add a little corn, tomato and green onion, then sprinkle with queso fresco. 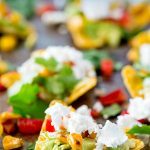 If you love food why not subscribe to my newsletter, I will drop you an email every now and then, just to say hi and send you a couple of recipes I think you might love, like these Individual Fully Loaded Tortilla Chips. Loving this idea! Perfect for parties and I love the flavors 🙂 Plus I’m all about easy dishes. These are amazing! I could eat these every day! 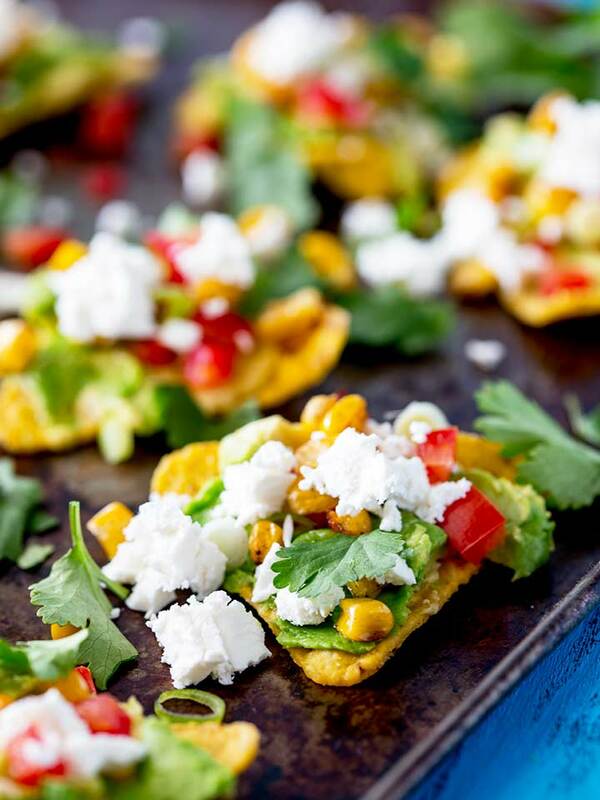 Love mine with extra queso fresco – such a fun snack!